Is an Apple Short the Trade of the Year? 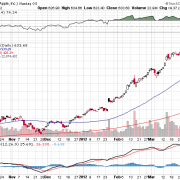 When Apple (AAPL) made its three day, $50 move up last week, it created $55 billion in new market capitalization. That 72 hour addition alone would rank it as the 100th largest company in the world besides Boeing (BA), Union Pacific Railroad (UNP), and Nike (NKE). Trading volume in Apple calls is has smashed all records. The action has been more frenzied than seen in any single name since the height of the dotcom bubble 12 years ago. I tried to take a bite out of Apple, selling 20% deep out of the money, front month calls. It looked clever for exactly two weeks. Instead, Apple took a bite out of me. When the appreciation suddenly accelerated on no news specific to Apple, implied volatility for the options popped from 30% to 40% in an hour, and I got stopped out. Moves like this are unprecedented in the history of the options market. I know people who are doubling their money every week, buying out of the money Apple weekly calls, and rolling their way all the way up, knowing full well that their last trade will result in a total loss. I thought ?well, that?s pretty interesting?, and set to write up a Trade Alert to buy the $500 puts. But by the time I finished writing it, Apple fell $25 and the puts doubled. I missed the entry point so I decided to wait. 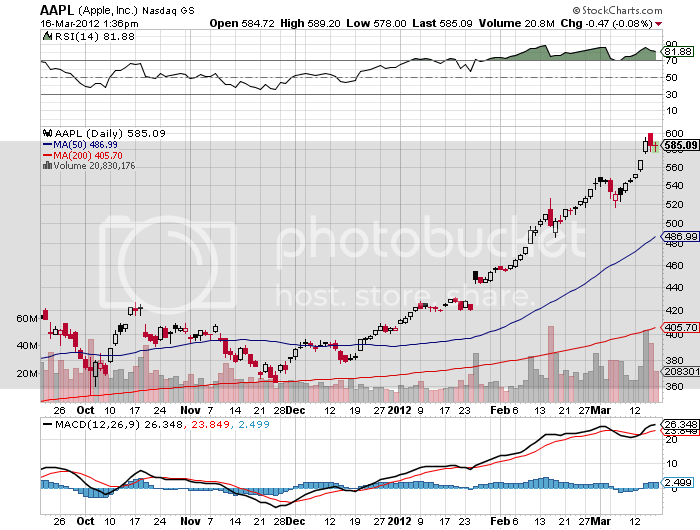 I love Apple stock, and it now looks like it will hit my long term $1,000 target sooner than later. I have been filling up my house with Apple gadgets as fast as I can, like everyone else, picking up an iPhone, a MacBook Pro, and a MacBook Air. The ecstatic people on TV this morning piling into Apple stores at the crack of dawn to buy the new iPad behave like they?re just won the lottery. But I also know what a parabolic stock move looks like on the charts, and I have never seen them end in anything but tears. At some point they end, falling back down to a trend line, even if that trend remains up. 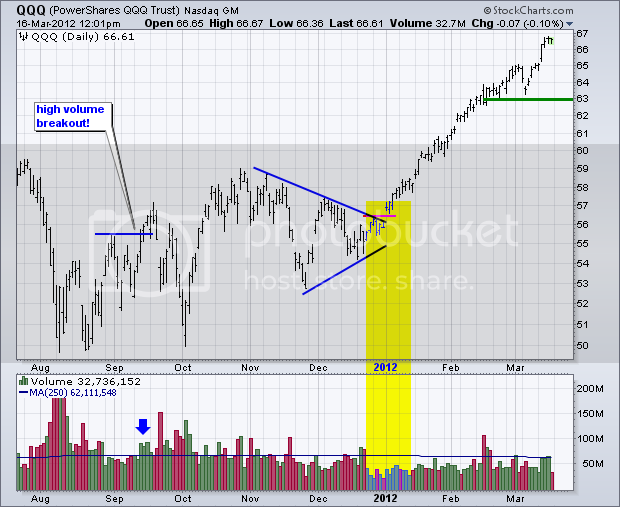 The volume on the downside is even greater than on the upside. I image that quite a lot of the recent buying has been on margin or with huge leverage. Apple stock is cruising for a bruising, and no one would be surprised to see a sudden $100 sell off. I?ll tell you when to put on this trade. Wait for the next three day, $50 spike, and then commit 1% or 2% of your capital, no more. You are looking to risk 1% to make 10%, not 100% to make 1,000%. I frequently get resumes from those who tried the later and are now unemployed, and believe me, you don?t want to try this. Of course, it is possible that the final $50 spike is behind us, in which case this entire discussion has been academic. But it is still a good exercise to carry out to learn what is possible. And since St. Patrick?s Day is upon us, you might want to down a quick shot of Irish whiskey first, neat, if you end up doing the trade. https://www.madhedgefundtrader.com/wp-content/uploads/2019/02/mhft_2ab1cd7cc5e7a19b697311f13459e0fa.png 0 0 DougD https://www.madhedgefundtrader.com/wp-content/uploads/2019/02/mhft_2ab1cd7cc5e7a19b697311f13459e0fa.png DougD2012-03-18 23:04:482012-03-18 23:04:48Is an Apple Short the Trade of the Year?